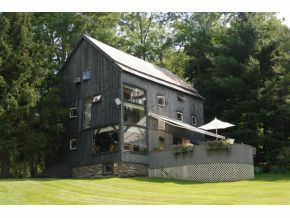 80 Cross Road, Stowe VT "The Barn Estate"
Sophisticated and charming are the words that come to mind when you step into this renovated barn. Stately situated on the edge of a sixteen-acre meadow, the home commands views of nearby farms and soaring mountains. Architect Graham Goldsmith, of Nantucket fame, designed the renovation. He respected the original post and beam structure and showcased its warm polished patina. Having a flair for style and drama, Mr. Goldsmith remembered the days when he would walk through barns and see the outside light shining through the barn board. Taking that concept, he installed a two-story glass window behind the barn beams that not only accents the framework on the barn but also brings views and light flooding into the living and dining areas. Imagine walking on a path through stately trees, and casual flower gardens to knock on the original barn door. The door is opened to a charming brick floored entrance hall. As you turn the corner, your visual senses are astounded. A smile immediately forms as you breathe in the effect of the soaring two-story glass wall of the living and dining room. Original barn floors are polished to a warm brown patina and another large glass window frames the swimming pond in the meadow. The charming cook's kitchen is efficient but roomy. A breakfast bar with kitchen stools under a window, gives a peek-a - boo view of the deer picking. their way across the meadow to taste early fall apples or drink from the pond. A screen door opens to a silo style deck. From here, watch the mother and her ducklings in the pond, and enjoy a late summer's dinner. A perennial and herb garden is just a snip away from the kitchen. On the second floor are a master bedroom and a guest room each en suite. The master is roomy and features a separate steam shower and large soaking whirlpool tub. Each bedroom opens onto a landing overlooking the dining area, as well as views of the meadow. The third floor is where the fun begins. From the stairs you enter a large den with two bedrooms and a sleeping loft that any child, and many adults, would find magical.